Its an honour for me to appear regularly each week on Melbourne Radio 3AW talking photography with Ernie Sigley. 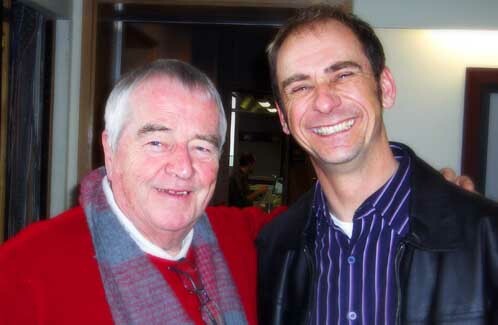 Ernie is an Australian entertainment legend and is the funniest bloke - on and off the air. Perhaps he is funnier off air when he knows no one is listening except me... On air? He and I banter on the subject of digital photography and I am happy to take questions on air. I will be appearing again each week on Melbourne Radio 3AW (693 on your Am dial) on Wednesday afternoons at 1:30...ish. I f you wanna listen online, click on the very bad picture of Ernie and me above. Creating a magazine is never easy, and today's photographic industry climate is tough. That is why I am once again proud to announce that the latest issue of Total Image and Better Pictures is on camera store shelves once again. 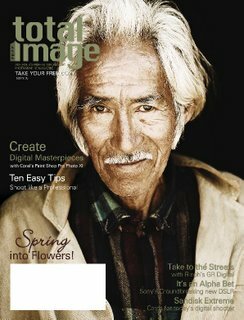 The cover of Total Image features a portrait of Antonio, a man who stood silently in a doorway of his mudbrick home in Northern Argentina while 8 photographers snapped his portrait. This one was my favourite, especially after having been given the treatment in Corel's new Paint Shop Pro Photo XI. In this issue of Total Image and Better Pictures we give you ten easy tips for that professional approach to your photography. We also get you into flowers for the Spring season. We look once again at the Ricoh GR Digital as well as the Sony Alpha and the Sandisk range of Extreme cards. If you can't find a copy in your local camera store, contact me and I'll tell you where you can get hold of one in your local area. I have been honoured with an invitation to photograph Leanne and Tyler's wedding in Edmonton Alberta on October 21st. Leanne and Tyler were looking through my online wedding portfolio and decided that they wanted me to come. I am truly honoured. My lucky assistant will by my son, Nathan, who, due to his ongoing Chronic Fatigue cannot travel with me on my photo tours. Nathan is 15 and a great photographer in his own right and so we will be headed for the Rockies for a few days to do some photography together while we are there. It will be a great opportunity for us, one that does not come along every day. No doubt there will be some new Canada images for my website when I return. Naturally, I will keep you posted!